Each event is illustrated with our photograph albums curated from flickr and illustrated with short films for you to remember the joyful events! This free, open-to-all choir was led by Rowena Whitehead, Cycle of Songs Choral Leader. It met for four sessions on Wednesday evenings (4th, 11th, 18th June, and 2nd July) from 7pm-8.30pm to learn songs specially composed for this project and we welcome singers of all ages whatever your previous singing experience. Anyone was welcome to join and we had over 100 participants sign-up. There were three performance opportunities and participants were welcome to be involved in as many of them as possible. You can find out more about these events below or you can visit our News page where blogs about the events can viewed. We also have many pictures from the rehearsals, recordings, and public events available on our Flickr page. This event took place between 10:15am and 12:30am on Monday 7th July for our signed up Cycle of Songs choir members. 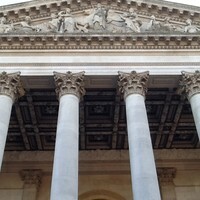 They sang from the front steps between 11.30am and 12.30am at the Fitzwilliam Museum, Trumpington St, Cambridge CB2 1RB. 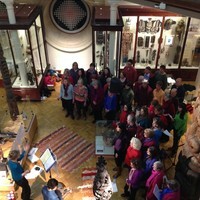 Cycle of Songs Choirs were invited to participate in one of two ways – by joining the primary school choirs at the Fitzwilliam Museum or to be part of the Cycle of Songs Choir to sing a number of songs together. The choirs were led by by Rowena Whitehead, Cycle of Songs Choral Leader, Kirsty Martin, Anna-Louise Lawrence, Hannah Adam, Rebecca Malton, Arlette Overman, Tizzy Faller and Mario Satchwell. This was a unique event that brought together the entire Cycle of Songs Choir, a number of schools, the Fitzwilliam Museum, and CaMEO to collectively celebrate in song the arrival of the Tour de France in Cambridge. This event was held between 6pm and 8:30pm on Saturday 5th July at the Jesus Green Open Air Swimming Pool, off Chesterton Road, Cambridge, CB4 3BD. Helen Weinstein and Sam Johnson from the Cycle of Songs team attended to give out the app maps and talk to families about the Cycle of Songs project, and encourage them to engage with the app and test it out! It was a great atmosphere and easy to sit with people to show them the app on our phones and leave them with leaflets to take home. 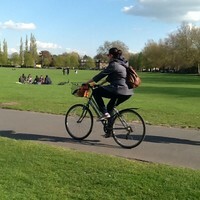 The sun was out and the water in Jesus Green Pool was welcoming for all that came. Many people came to the 10th annual 'Talking in Tune Sing and Swim for Water Aid' at Jesus Green Swimming Pool for a mellow summer evening of music, community song, swimming and picnicking. Free entry was granted to Cycle of Songs singers who attended the 2 July practice (but donations were welcomed as all the proceeds were donated to Water Aid). If you have any quesitons about the event or future events, do call Rowena Whitehead at 'Talking in Tune' office: 01223 573288 or email talkingintune@ntlworld.com. The Andy Bowie Jazz Quartet played mellow music as people swam and picnicked. They were also joined by Pete Towers and his Amazing and Unique Kitchen Sink Guitar, Phil Rose and Tom Ling and Jon Betmead. Local choirs included ReSound, Good Vibrations, Milton Road and Arbury Primary School Choirs, and singers from the Cycle of Songs Choir, formed to celebrate the arrival of the Tour de France Cyclists in Cambridge on 7 July, who hot footed it from Parkers Piece where they sang from 3pm at the Big Day Out. There was a community poolside sing along of summery songs and song sheets could be downloaded from the Talking in Tune website. Home-made cakes were on sale and the poolside cafe was also open. Inflatable crocodiles and inflatables accompanied the children and adults in the pool too as the singing and music provide a wonderful soundtrack to the evening! This event took place between 3pm and 6pm on Saturday 5th July at The Main Stage Marquee, Parker's Piece, Cambridge, CB2 1AA. On Saturday 5 July from 3-4pm, The Cycle of Songs Choir met in the Main Stage Marquee for an open rehearsal in the afternoon on Parker’s Piece at the Big Weekend – and then sang "Why We Ride" with other songs to a packed marquee. We were joined by singers from other choirs such as the Spinney Singers and Good Vibrations. At 4pm, The Dowsing Sound Collective took to the main stage to represent Cycle of Songs - with a set including "Reality Checkpoint", their Cycle of Songs composition about Parker's Piece. You can hear "Why We Ride" by going to the Resources Page. To view pictured from this event you can click here. Then the Cycle of Songs film was played in the Marquee until 6pm, and the audience were shown the app by Cycle of Songs team and encouraged to download & enjoy the songs. This rehearsal was led by Rowena Whitehead, Cycle of Songs Choral Leader, and took place between 7-8:45pm on Wednesday 2 July 2014 at the West Road Concert Hall in the Faculty of Music, University of Cambridge, 11 West Rd, Cambridge CB3 9DP. This was the last of four free, open-to-all rehearsals for the Cycle of Songs Choir and we welcome singers of all ages whatever your previous singing experience. There were three more performance opportunities after this practice and we welcomed singers' involvement in as many of them as possible. 1. Parker's Piece, Big Weekend on Saturday 5 July at 3pm: We will sing from 3-3.45pm in the Main Stage Marquee and then on Parker’s Piece as a Pop Up Choir. The Dowsing Sound Collective will perform on stage from 4pm to 4.45pm and will sing their specially written song for this project. There will be demonstrations of the app in the marquee until 6pm and if you bring along a smart phone, you will be able to download the app so you can listen to all our songs on your phones. Please come and bring families and friends – who will be encouraged to sing! 2. 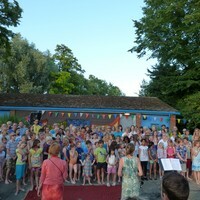 The Talking in Tune Sing and Swim for WaterAid at Jesus Green Pool on Sat 5 July 6-8.30pm. 3. Song Fest at the Fitz! The Fitzwilliam Museum, Trumpington St, Cambridge CB2 1RB on Monday 7th July: The choir will be joined on the steps of the Fitzwilliam Museum by up to 200 children from local primary schools and there will be singing from 11.30am to 12.30pm in the build-up to the cyclists’ arrival and as they pass by. Choir singers will need to arrive at the museum between 10.30am and 10.45am. Only those who have registered to come to this event will be able to gain access to the steps. . If you’d like to sing with us, please fill in a sign-up sheet. 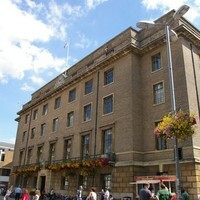 This event took place between 11am and 1pm on Saturday 21st June at The Guildhall, Market Square, Cambridge CB2 3QJ. 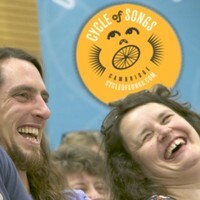 All members of the Cycle of Songs Choir and friends and families were invited to come together at 11.00am on Sat 21st June to join the Cycle of Songs Choir for a big community singing session at The Guildhall. There was a free open-to-all one hour singing rehearsal in the Guildhall led by Rowena Whitehead, Cycle of Songs Choral Leader and Kirsty Martin, Composer to practice ‘Why We Ride’, the Cycle of Songs anthem which we sang as a massed Pop-Up Choir outside the Guildhall at 12.30pm. We also sang ‘Allez les Velos!’ as we are gathering. Sound files and lyrics are available for both songs on the Resources page of this website. The Pop-up Choir sang two times, once in the Market Square and once outside Great St Mary’s Church, opposite Kings College – with families, pals, fans, and the unsuspecting public enjoying it! This event was filmed and recorded. If you plan to come along, please listen to the song in advance and learn as much as you can on the Resources page of this website (a lyrics sheet and scores is also there). To see photographs from the event please visit our Flickr page here. To read a blog about the event please click here. Those who wanted to be involved in this event could get involved by filling in a sign-up sheet at /sign_up/ or cycleofsongs@gmail.com. 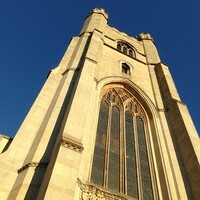 The event took place between 2-4pm on Sunday 11th May at Great St Mary's Church, Senate House Hill, Cambridge CB2 3PQ. It was a fantastic opportunity for participating choirs to meet at a song filled celebration! Each choir that was invited sang a number of their favourite songs from their recent repertoire to the other choirs in an allotted ten minute slot. This took place after a welcome song was sung together, taught on the day by Rowena Whitehead from Talking in Tune. In addition to this, all of the choirs were filmed singing together for a montage for press film and photography. Photography of the performances are available on our Flickr page so that you can use them on your website and share across social media. We would also love for you to share some of your photos or videos if you took them. These can shared on the official Cycle of Songs Flickr Page https://www.flickr.com/groups/cycleofsongs. The event had a relaxed festival feel with refreshments and a live band afterwards. Families and friends were welcome and there was an open door to the street to welcome new singers to sign-up for the Cycle of Songs Choir (for those who are not already in a regular choir) which Rowena will lead. It was a great day which saw over 350 people attend. You can read some of the feedback from singers, choir leaders, church staff, and the public via our blog post. This rehearsal was led by Rowena Whitehead, Cycle of Songs Choral Leader, and took place between 7-8:30pm on Wednesday 18th June 2014 at the Recital Room in the Faculty of Music, University of Cambridge, 11 W Rd, Cambridge CB3 9DP. This was the third of four free, open-to-all rehearsals for the Cycle of Songs Choir. The choir met for four sessions on Wednesday evenings (4th, 11th, 18th June, and 2nd July) from 7pm-8.30pm to learn songs specially composed for this project and we welcomed singers of all ages whatever their previous singing experience. To see pictures from this rehearsal you can visit our Flickr page here. There were three performance opportunities and we welcomed involvement in as many of them as possible. Everyone was welcome who wanted to add their voice to this community celebration. The songs were be taught by ear and lyrics and recordings of the parts were available on the Cycle of Songs website. 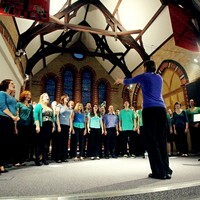 Interested singers could register their interest to take part by using our online sign-up sheet. 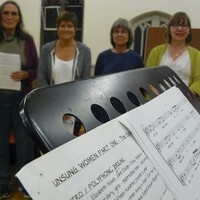 This rehearsal was led by Rowena Whitehead, Cycle of Songs Choral Leader, and took place between 7-8:30pm on Wednesday 11th June 2014 at Cambridge Junction, Clifton Way, Cambridge CB1 7GX. This was the second of the four free and open-to-all rehearsals for the Cycle of Songs Choir. We were joined by The Spinney Singers from the Spinney School and the Cambridge Ten Sing, who performed as a warm-up and in the mid-session break. The choir met for four sessions on Wednesday evenings (4th, 11th, 18th June, and 2nd July) from 7pm-8.30pm to learn songs specially composed for this project and we welcomed singers of all ages whatever their previous singing experience. To see pictures from this rehearsalyou can visit our Flickr page here. To read a blog about this rehearsal you can click here. 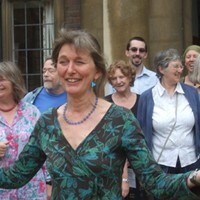 This rehearsal will be led by Rowena Whitehead, Cycle of Songs Choral Leader, and take place between 7pm and 8:30pm with the doors opening at 6:30pm on Wednesday 4th June 2014 at Kettle's Yard, Castle St, Cambridge CB3 0AQ. The choir was also treated to performances from Alex Cook and Hannah Brock between 6:30pm and 7pm. This was the first of four free, open-to-all rehearsals for the Cycle of Songs Choir. The choir met for four sessions on Wednesday evenings (4th, 11th, 18th June, and 2nd July) from 7pm-8.30pm to learn songs specially composed for this project and we welcomed singers of all ages whatever their previous singing experience.